Overwintering mums is a wonderful way to save money and add perennial beauty to the landscape! Chrysanthemums, or “mums” as they are often called, are one of the first plants people turn to for fall color. The vast array of colors available look incredible in pots, containers and baskets. But they can also be amazing when planted in the landscape. And perhaps even better, many varieties are hardy enough to come back year after year! Although most treat Chrysanthemums simply as an autumn annual, there are hardy varieties that can be grown as perennials. These overwintering mums can provide beautiful foliage in the spring and summer, and gorgeous blooms in late summer and fall year. Overwintering mums is quite easy with just a bit of care. It is important to note that there are two distinct types of Chrysanthemums. There are floral varieties that are grown purely for blooms. And there are “hardy” or “garden mums” that can be grown with a bit of care as perennials. The difference between the two is mainly in the roots. Floral Chrysanthemums have very shallow roots, and simply can’t stand up to the rigors of wintertime when planted outside. Hardy, or garden mums on the other hand, have a deeper root system. In zones 5 and up, with a bit of special attention, hardy mums can be planted as perennials. Chrysanthemums that are purchased in the fall need special protection for their first winter. Leaving pots outdoors, even when labeled as a “hardy mum” is a recipe for disaster. The best way to protect is to bring plants indoors before the first hard freeze. Leave the foliage in place. Store the mums in a cool, dark area. Basements and garages work best for this task. Mums can be cut back in early summer to avoid early blooming such as this. The following spring, as soon as soil warms and the threat of a hard freeze is over, it is safe to plant in the landscape. 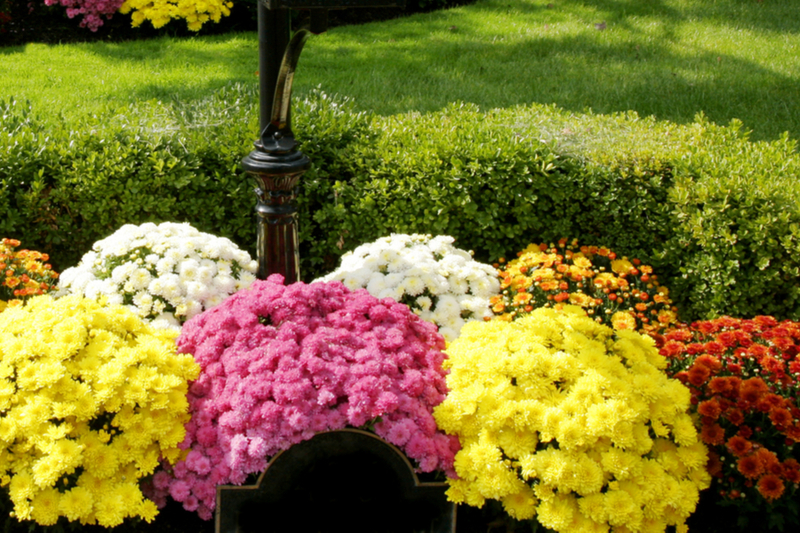 Mums perform best in fertile, well-drained soil. When planting, add in a bit of compost to help their root systems establish quickly. Once planted, cut the stems and foliage back to just above the soil line. Within a few weeks, you should start to see new growth emerging. Chrysanthemums are meant to naturally bloom in mid-summer, so if you are looking for brilliant fall color, you will need to cut them back a few times before they bloom early. This process is called “pinching back”, and can be done by simply trimming the plant back to a few inches tall. For most plants, trimming back in early July and again in August works best. This allows the new growth to come in more compact and bushy, for a great fall bloom. In the fall of the second year and beyond, leave the mums foliage in tact through the winter. Mulch the base of the plant with a thick two to three-inch covering of straw or leaves. This will help insulate the roots from extreme cold. In the spring, cut back the foliage, and repeat with summer cut back care. Mum plants can be split and divided in early spring if they become too large over the years. It is an excellent way to double your plants for free. This Is My Garden is a gardening website created by gardeners, for gardeners! We publish two garden articles every week, 52 weeks a year. Sign up below to follow along, and follow us on Facebook @ TIMG as well. You can also share your backyard gardening tips or stories with us at info@thisismygarden.com tobe our next feature! This article may contain affiliate links. How To Make Homemade Hot Pepper Flakes From Fresh Peppers!